I’ve posted previously about the opportunity I had to talk in depth with some of the folks from Cohesity at Storage Field Day 8. They’ve now come out with their “Hybrid Cloud Strategy”, and I thought it was worthwhile putting together a brief post covering the announcement. Cohesity CloudArchive is, as the name implies, a mechanism to “seamlessly archive datasets for extended retention from the Cohesity Data Platform through pre-built integrations with Google Nearline, Microsoft Azure and Amazon S3, Glacier”. This feature was made available as part of the 2.0 release, which I covered here. Cohesity CloudTier allows you to use public cloud as an extension of your on-premises storage. It “dynamically increases local storage capacity, by moving seldom-accessed data blocks into the cloud”. The cool thing about this is that, via the policy-based waterfall model, transparent cloud tiering can be managed from the Cohesity Data Platform console. Cohesity suggest that the main benefit is that end users no longer have to worry about exceeding their on-premises capacity during temporary or seasonal demand spikes. 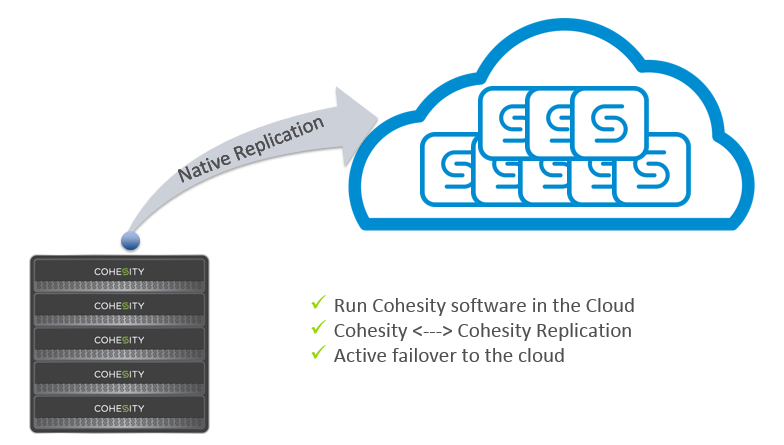 Cohesity CloudReplicate allows Cohesity users to “replicate local storage instances to remote public or private cloud services”. This has the potential to provide a lower-cost disaster recovery solution for their on-premises installations. Cohesity have said that this feature will be released for production use later this year. Everyone and their dog is doing some kind of cloud storage play nowadays. This isn’t a bad thing by any stretch, as CxOs and enterprises are really super keen to move some (if not all) of their workloads off-premises in order to reduce their reliance on in-house IT systems. Every cloud opportunity comes with caveats though, and you need to be mindful of the perceived versus actual cost of storing a bunch of your data off -premises. You also need to look at things like security, bandwidth and accessibility before you take the leap. But this is all stuff you know, and I’m sure that a lot of people have thought about the impact of off-premises storage for large datasets before blindly signing up with Amazon and the like. The cool thing about this Cohesity’s secondary storage hybrid cloud solution is that Cohesity are focussed on the type of data that lends itself really well to off-premises storage. I’ve been a fan of Cohesity since they first announced shipping product. And it’s been great to see the speed with which new features are being added to the product. As well as this, Cohesity’s responsiveness to criticism and suggestions for improvements has been exciting to see play out. You can check out a video of Cohesity’s Hybrid Cloud demo here, while the cloud integration demo from Storage Field Day 9 is available here. Alex also has a nice write-up here.